Snow For The Sacramento Mtn's Sunday - Christmas Week Forecast. (From Sept 30th - 9:10 AM MST This Morning). 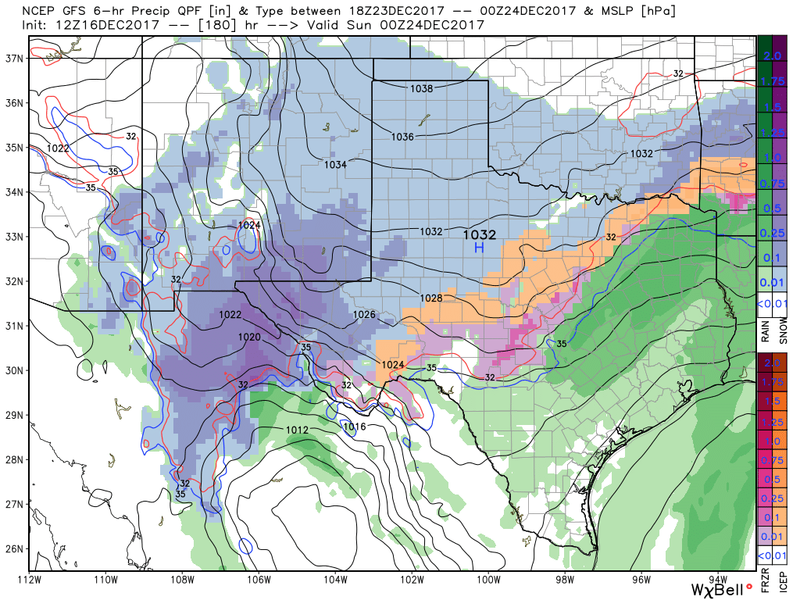 First Winter Storm Sunday & Monday. 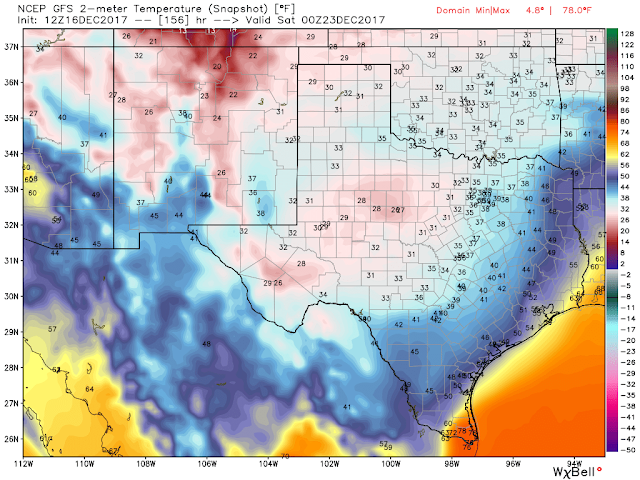 Valid At 5 AM MST This Saturday Morning. 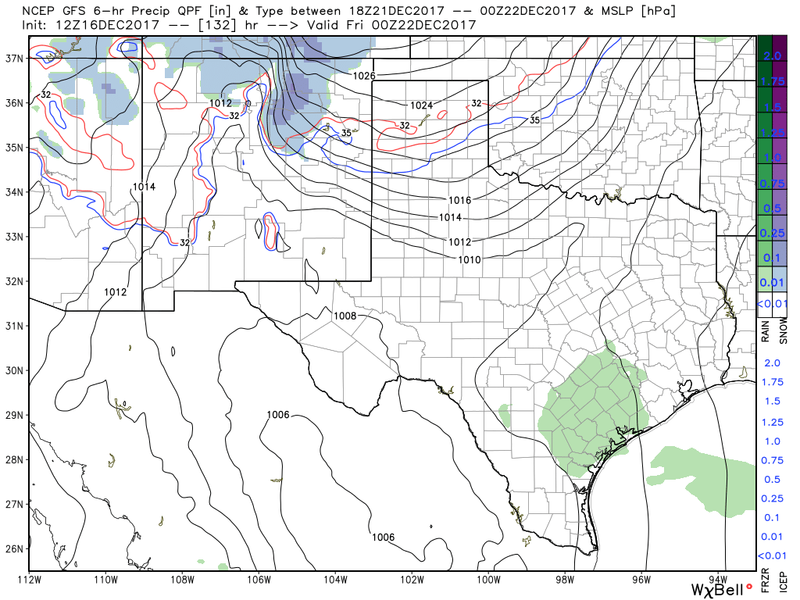 A closed upper level low has been wandering around northwestern and northern Mexico for the past several days and will lift northeast into the Texas Panhandle by sunset today with little affect on the local area. A trough of low pressure (see graphic above) stretches from Southern California northeastward into Western Canada. 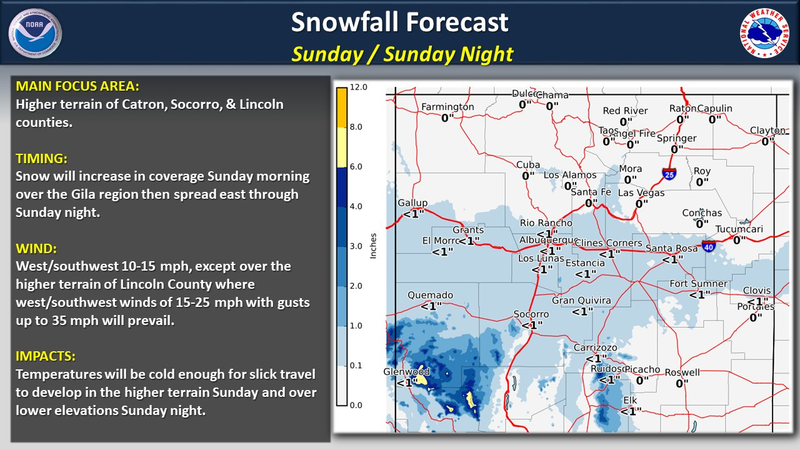 A second closed upper level low will develop over southern California this afternoon into tonight and slowly slide eastward to along or just south of the Arizona/Mexico border by sunset Sunday. Lowland Rain Showers & High Mountain Snows Sunday. 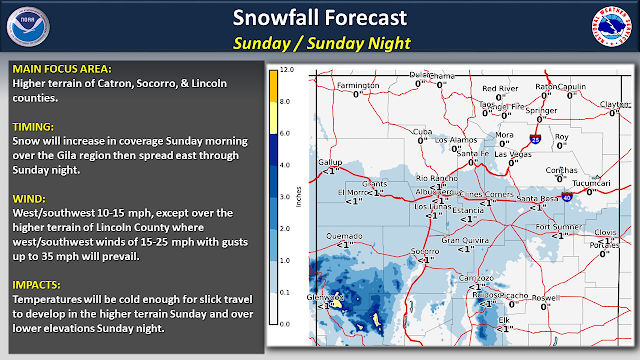 NWS Albuquerque Special Weather Statement. 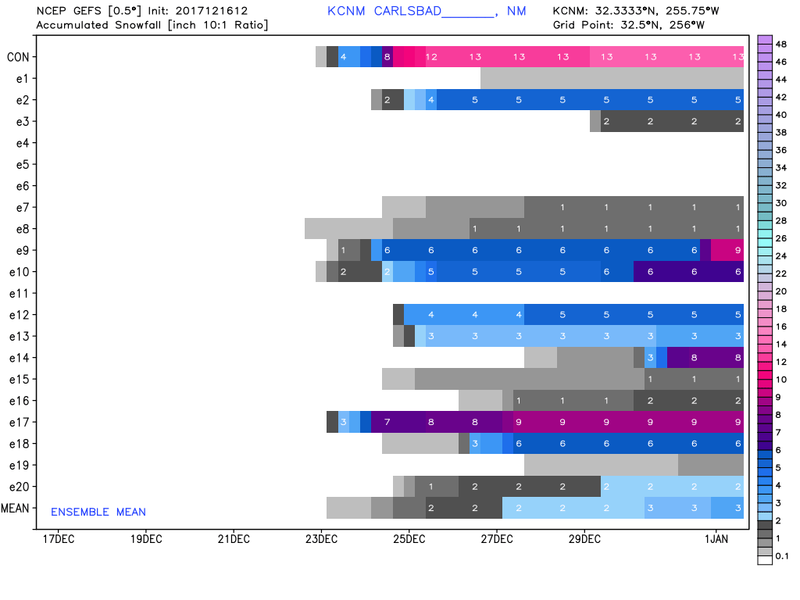 Both the GFS and the NAM-WRF models hit the higher elevations of the Sacramento Mountains hard with heavy snow with their latest forecasts as of this morning. 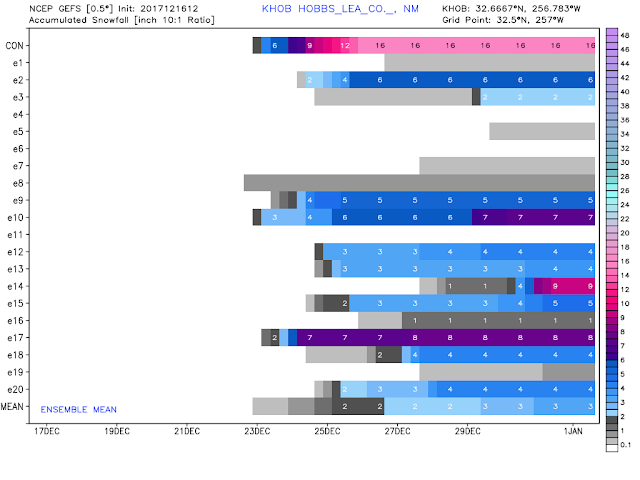 Both of these models dump about a foot of snow on the Cloudcroft and Ski Apache areas. 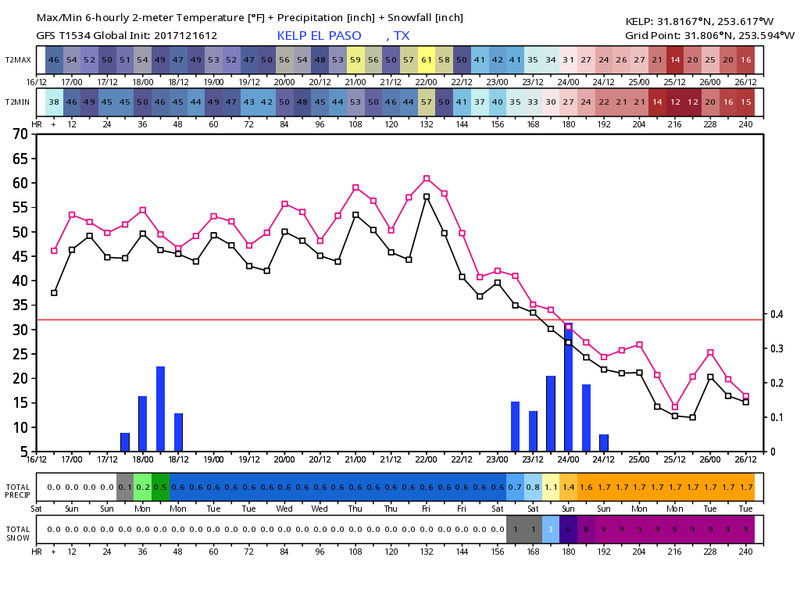 The NAM model just a dusting of an ich or so. 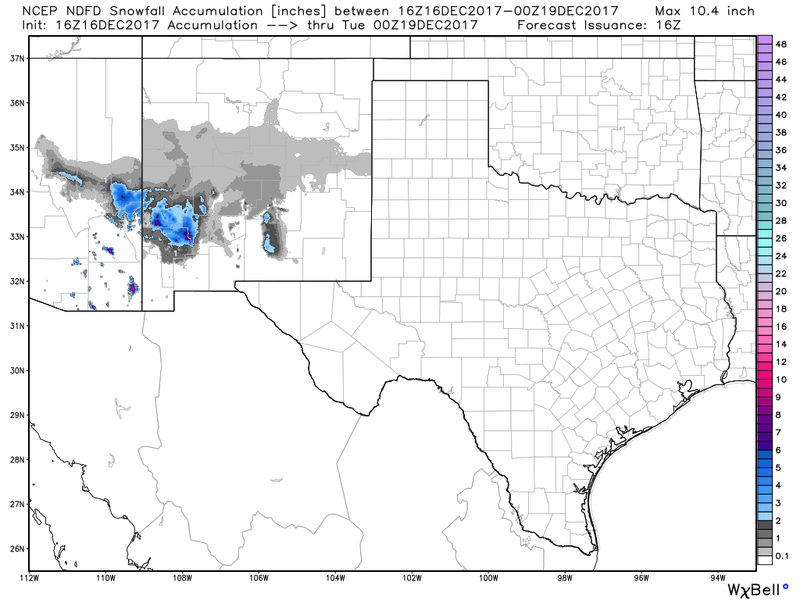 However our local National Weather Service Offices say only and inch or less for Ruidoso and maybe 1" to 3" for the Cloudcroft area. This next little storm will be a quick hitter and by Monday afternoon it will be a memory. Good news for Ski Cloudcroft and Ski Apache with more on the way. 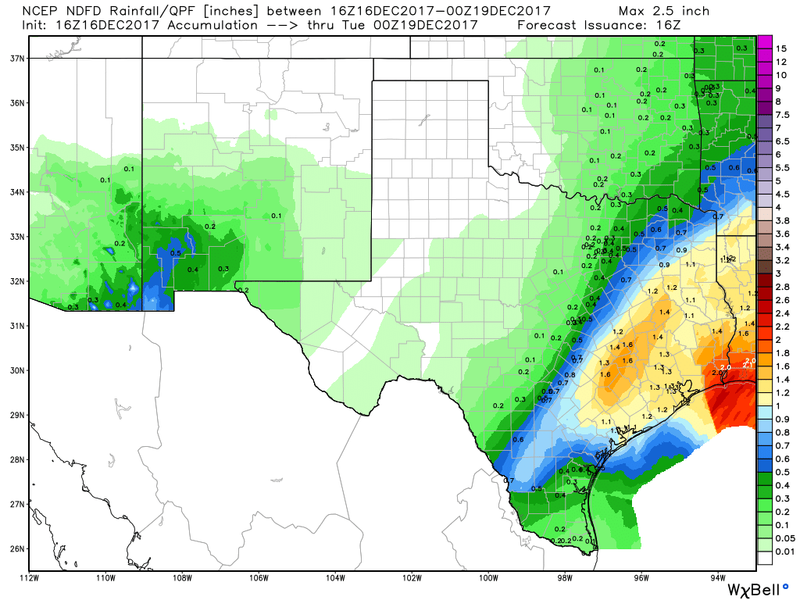 We have a chance for rain showers across Southeastern New Mexico Sunday afternoon and evening but none of the models seem very excited about this with forecast totals locally of a tenth of an inch or less. 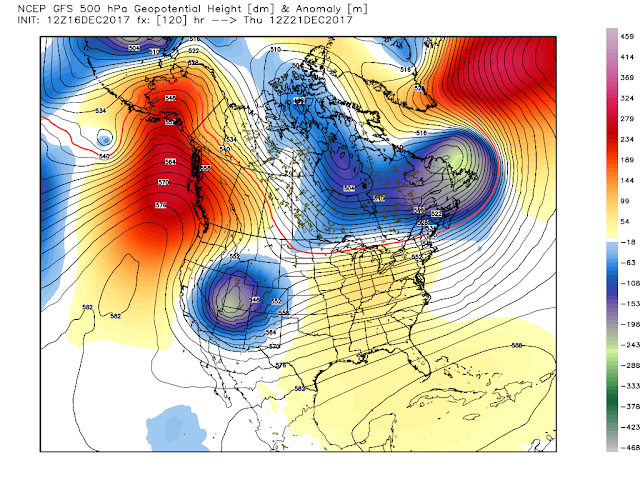 Without a doubt this upcoming holiday week poses some serious forecast challenges and will likely be very difficult! I am fairly certain that it is going to get much colder starting next Thursday night when a strong arctic cold front backdoors into the area. The cold will last right into Christmas it appears. 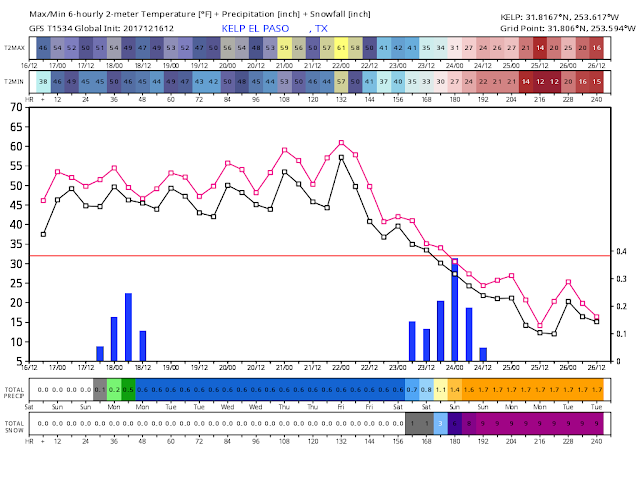 We may be looking at subfreezing temperatures or close to it from next Thursday night into Christmas Day. What is still up in the air is how much snow our Christmas storm is going to produce over the state and nearby areas. Model confusion reigns! For a week now the U.S. GFS model has been hammering the local area off and on with snow, heavy at that at times, and cold. 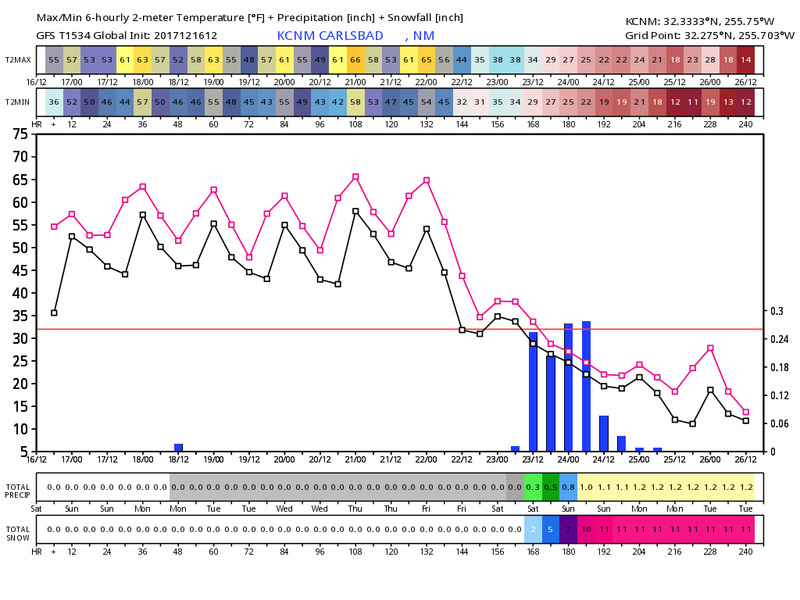 Normally you have to almost ignore one models forecast a week to 10 days or more out in time. But when a model persists with basically the same forecast (with some variations of course) it gets your attention. 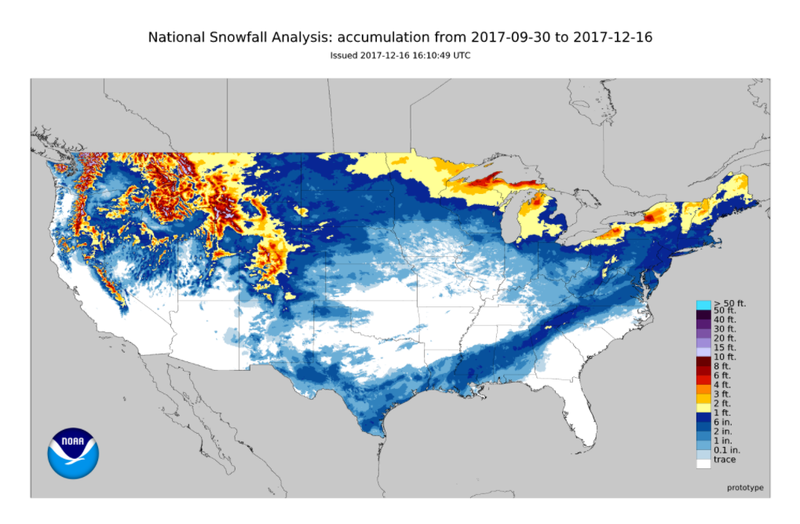 This happened with the Christmas snowstorm that dropped a foot to 14" on Carlsbad in 2011, and with the Blizzard the day after Christmas in 2015. 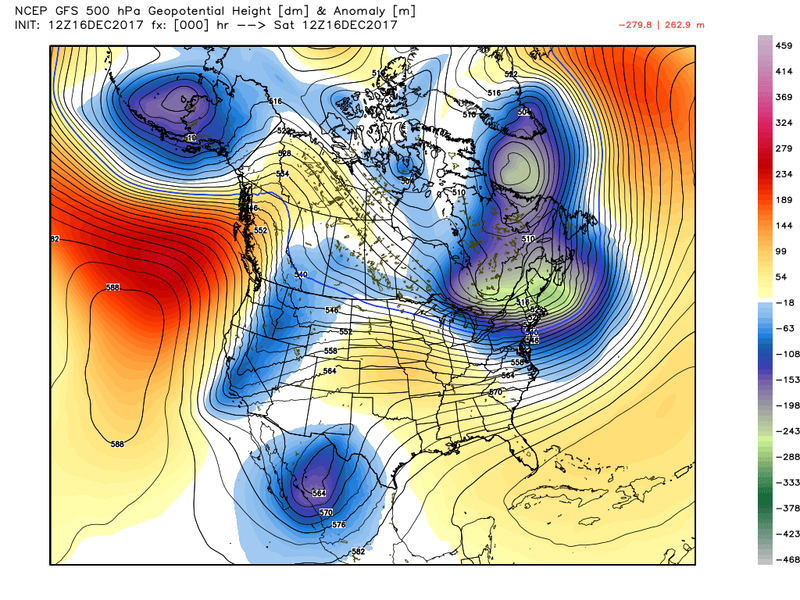 So its hard to ignore what the GFS has been cranking out with each run. 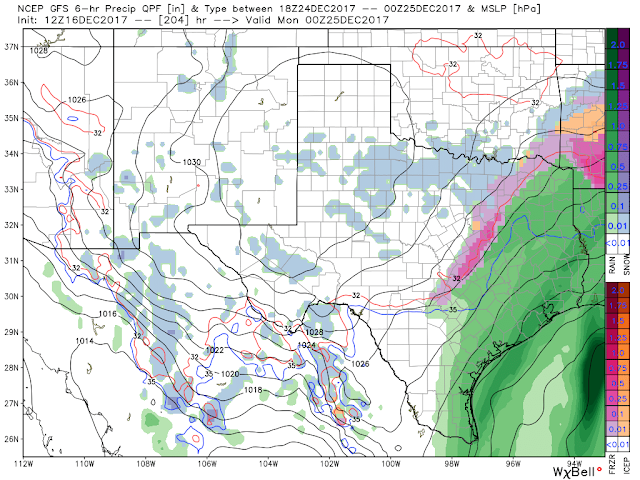 I've chosen its forecasts this morning for our Christmas storm and it represents the worst case scenario by far of all of the models and there is no guarantee at this point that this forecast will be right. 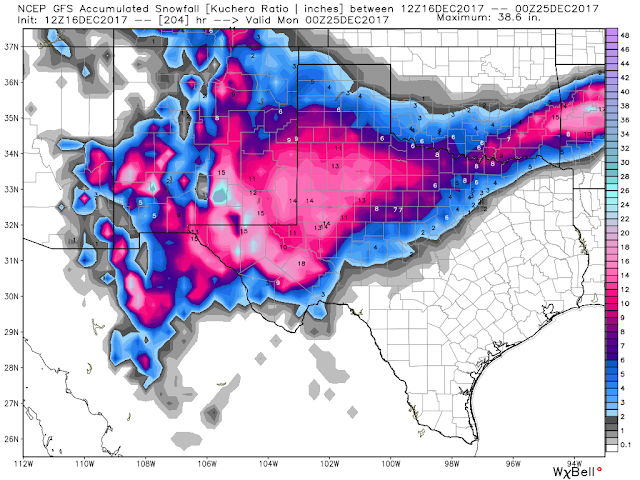 Will we get as much snow as this model is forecasting? Hard to tell yet...sorry but that's just the truth. 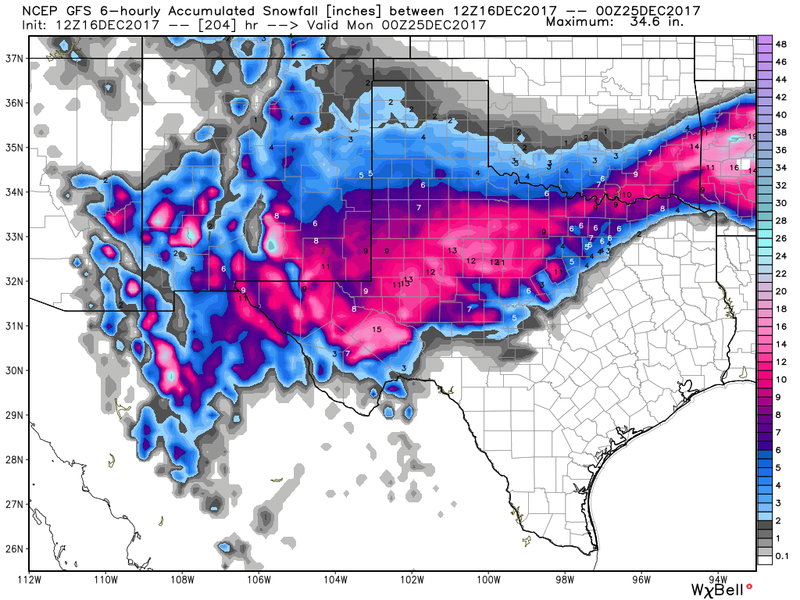 I will tell you that if this models forecasts continue trend-wise and pan out, we would be looking at another widespread high impact heavy snow event...comparable (snowfall-wise anyway) to the 2011 Christmas storm and the 2015 Blizzard the day after Christmas. 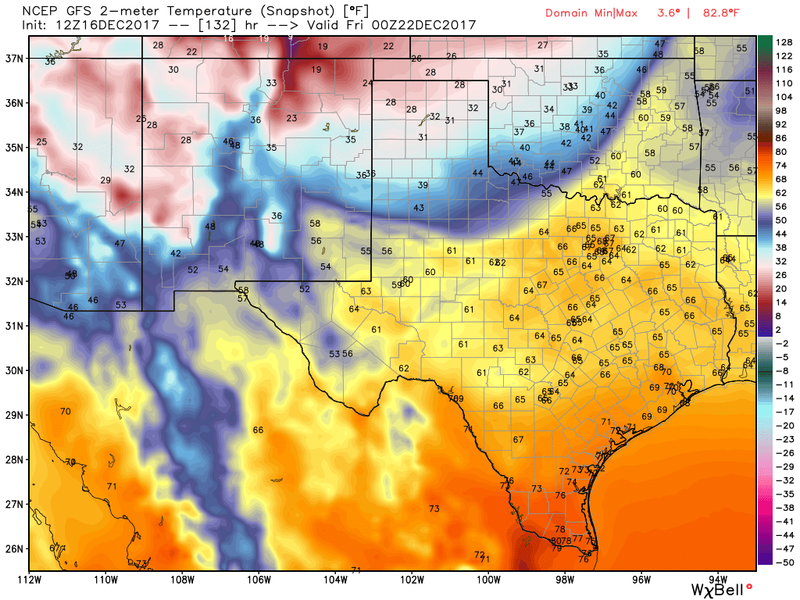 Remember that giant word "IF". 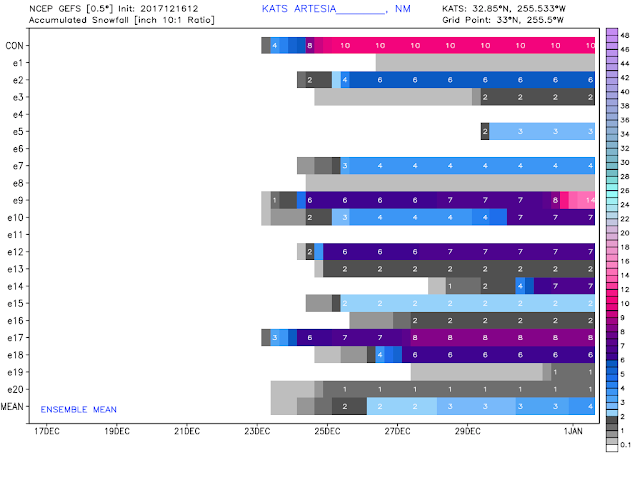 The Canadian model forecasts are in between the GFS, and the European model forecasts have far much less snow statewide. The European has bounced all over the place with heavy snow to no snow the several days. If the Canadian and ECMWF models are correct and the GFS is wrong then we will still see the cold but with much less snow...at least according to their forecasts as of this morning. 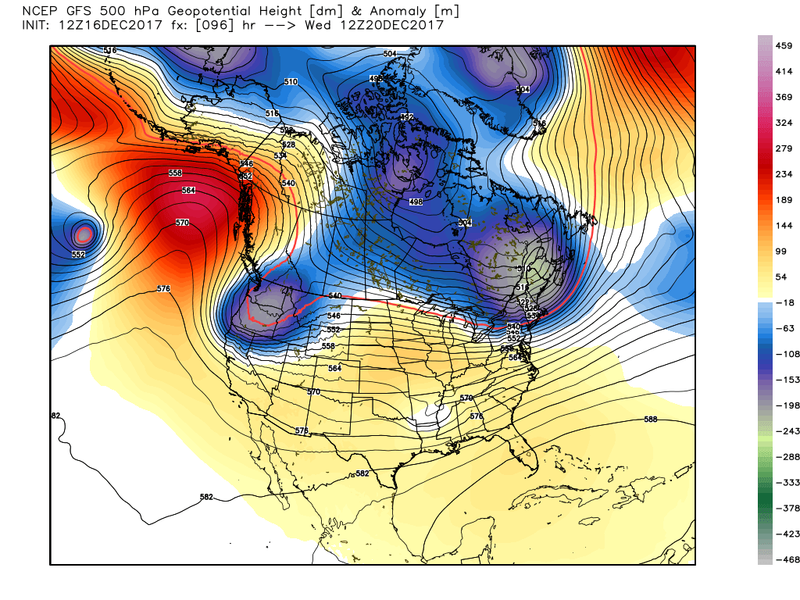 Truth is there is a lot of room for uncertainty and error with our forecasts yet. Valid At 5 AM MST Tuesday, Dec 19, 2017. 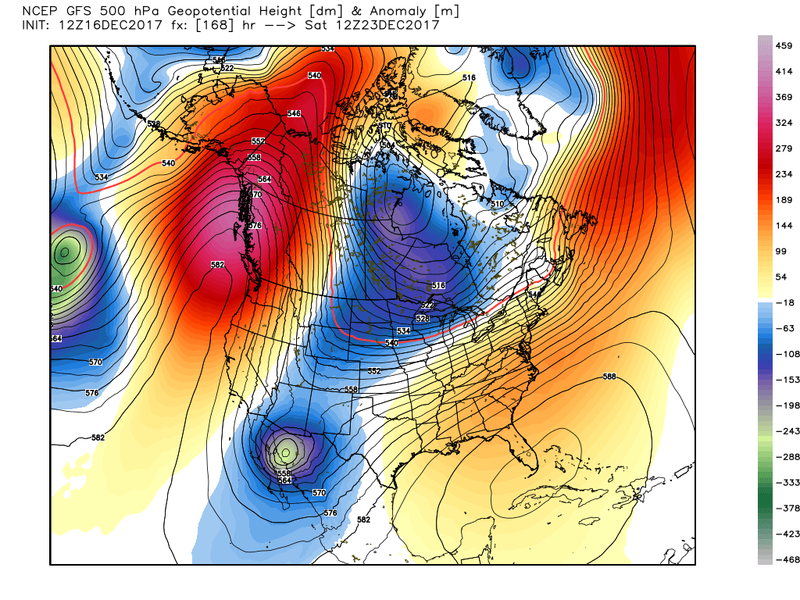 Come Tuesday morning our Christmas storm is forecast to have dived southeastward out of the Gulf of Alaska to just to the northwest of the Pacific Northwest. 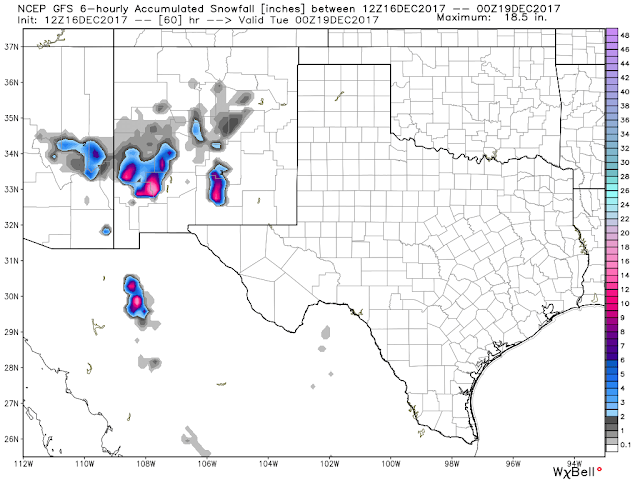 Valid At 5 AM MST Wednesday, Dec 20, 2017. 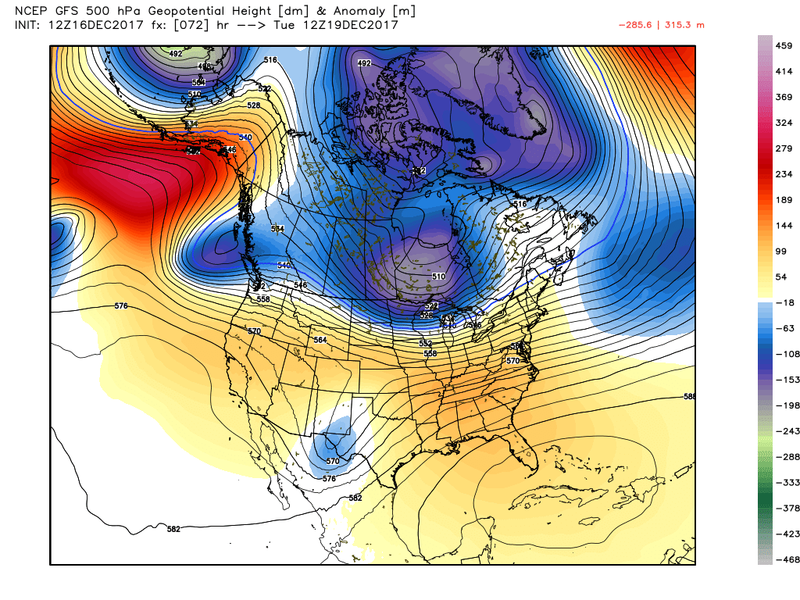 By Wednesday morning at sunrise it is forecast to be located over northern Oregon and southern Washington. 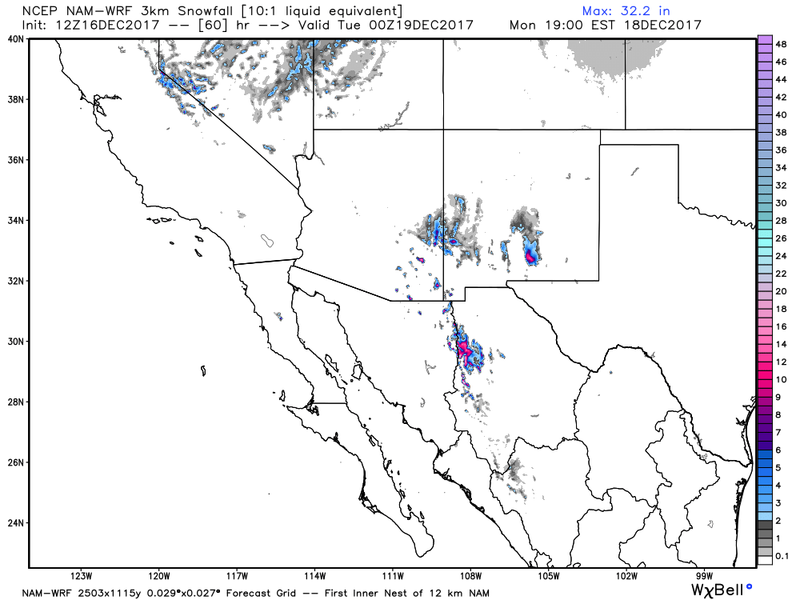 Valid At 5 AM MST Thursday, Dec 21, 2017. 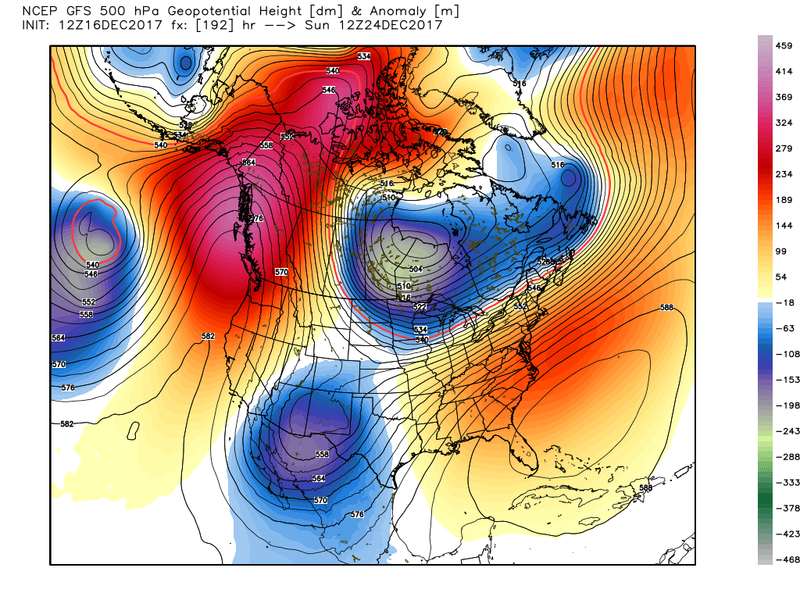 By Thursday morning it is in the process of forming a closed low over southwestern Utah. 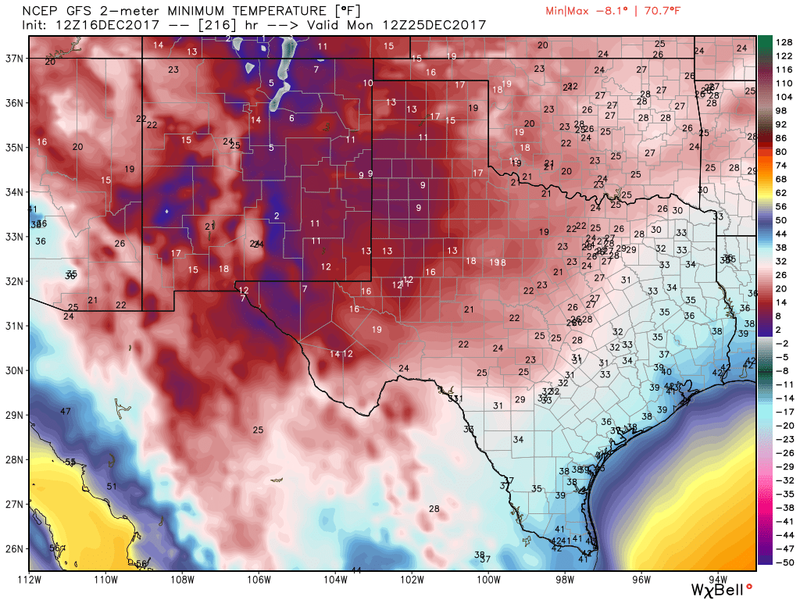 Valid At 5 AM MST Friday, Dec 22, 2017. Sunrise Friday morning the storm is settling into southwestern Arizona. 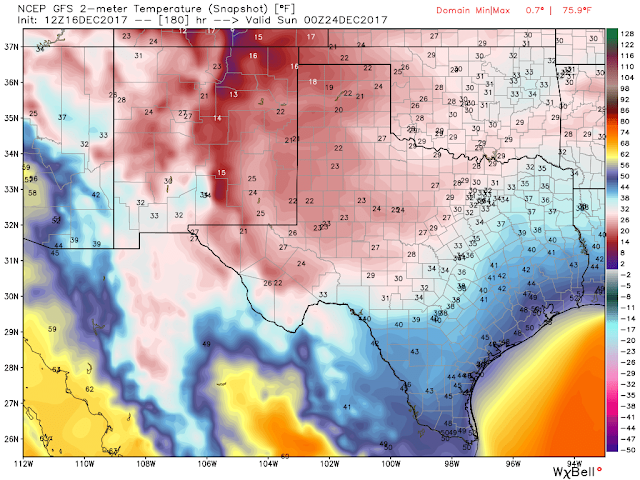 Valid At 5 AM MST Saturday, Dec 23, 2017. 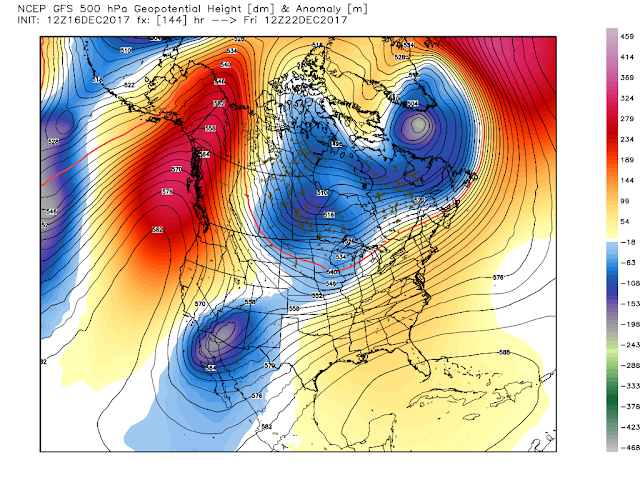 Valid At 5 AM MST Christmas Eve. 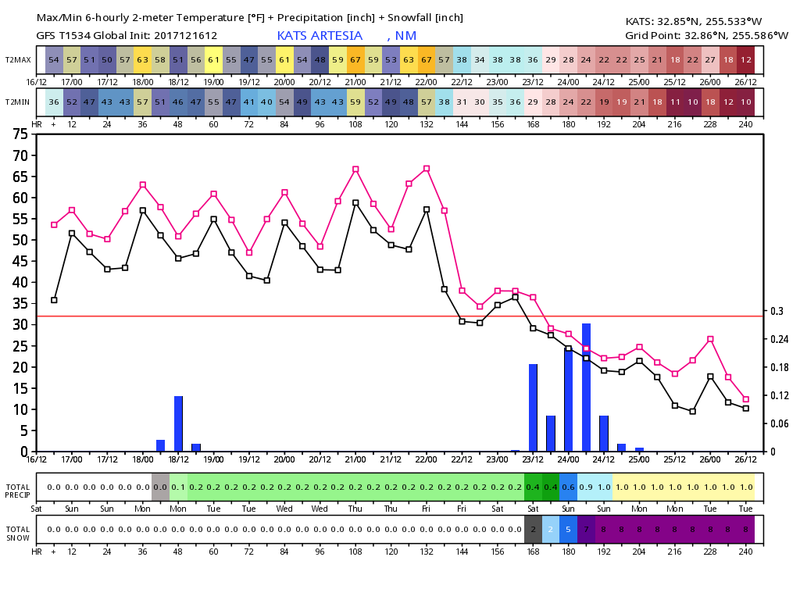 This forecast track of this potent winter storm is near perfect for producing heavy snow across the local area! Strong Arctic Cold Front Arrives Thursday! 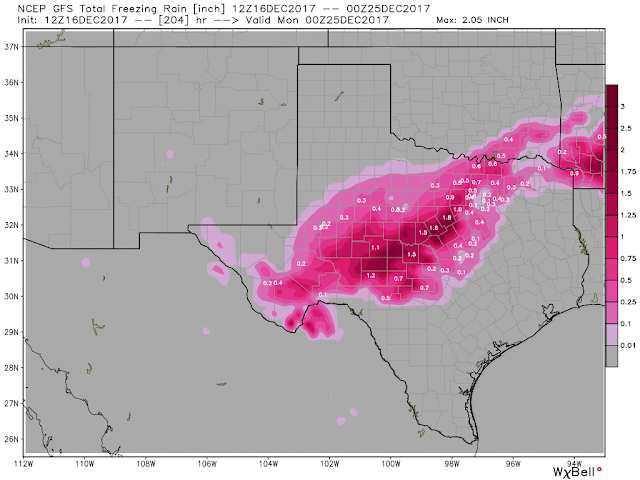 Again this is the worst case scenario forecast among the models as of this morning. 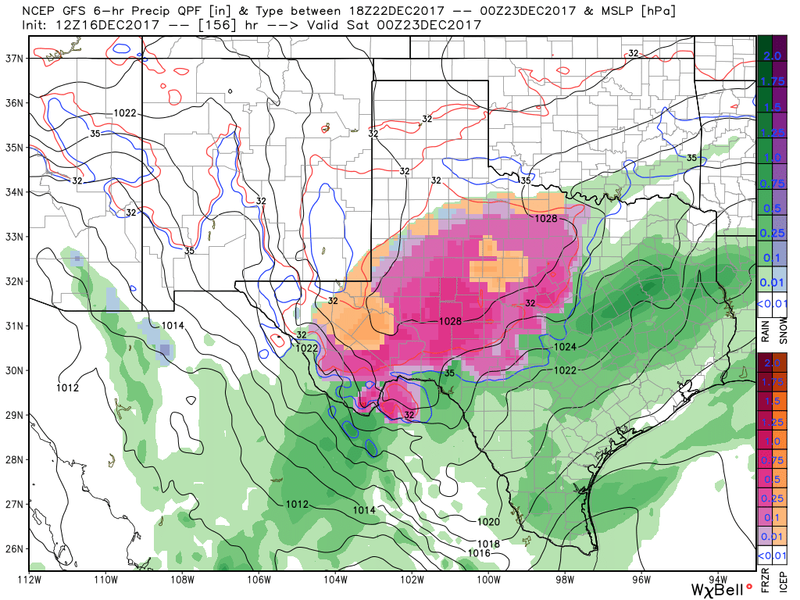 Given that trouble comes to the region in the form of freezing rain, sleet, and heavy snow. 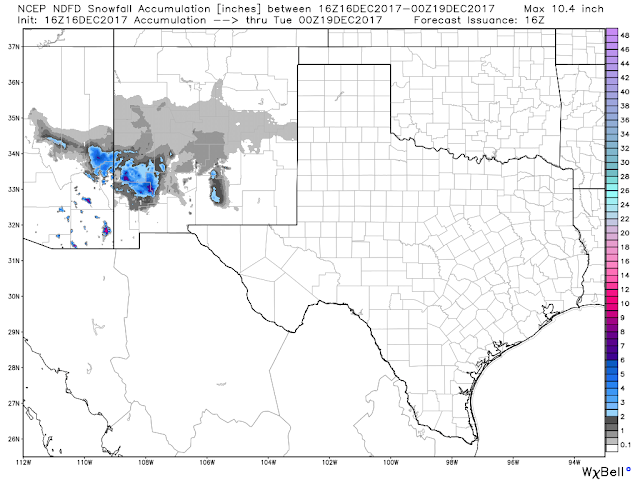 Valid At 5 PM MST Thursday, Dec 21, 2017. Valid At 5 PM MST Friday, Dec 22, 2017. 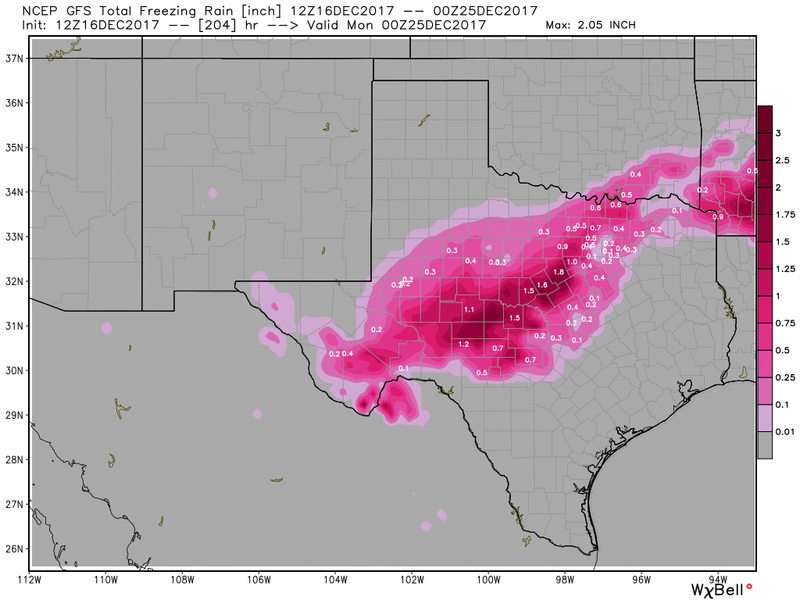 A significant ice storm over West Texas Friday? 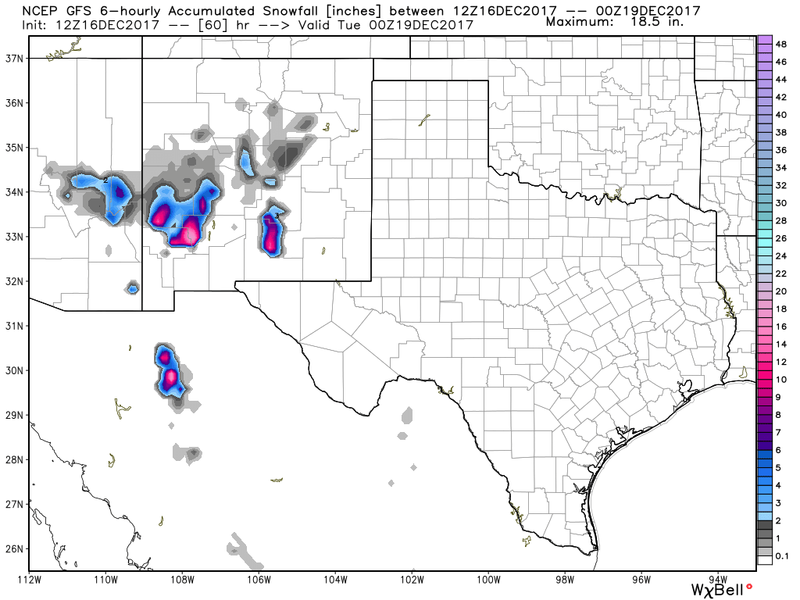 This mornings GFS forecast breaks out snow over Southeastern New Mexico Friday night continuing into Christmas Eve Day at sunset. The heaviest falling Saturday into Christmas Eve morning. Valid At 5 PM MST Saturday, Dec 23, 2017. 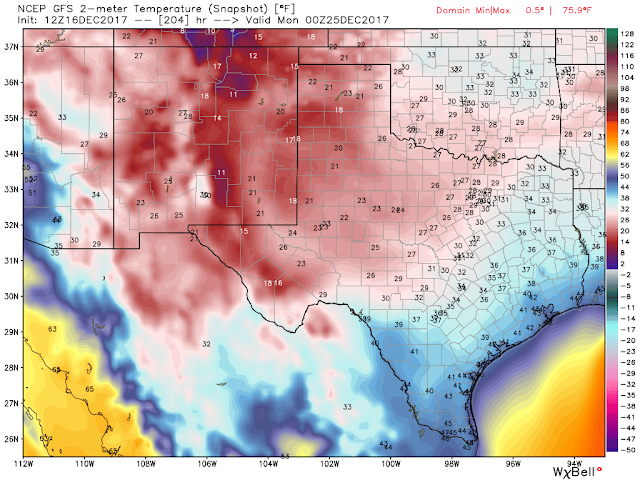 Widespread single digits and low teens Christmas morning! 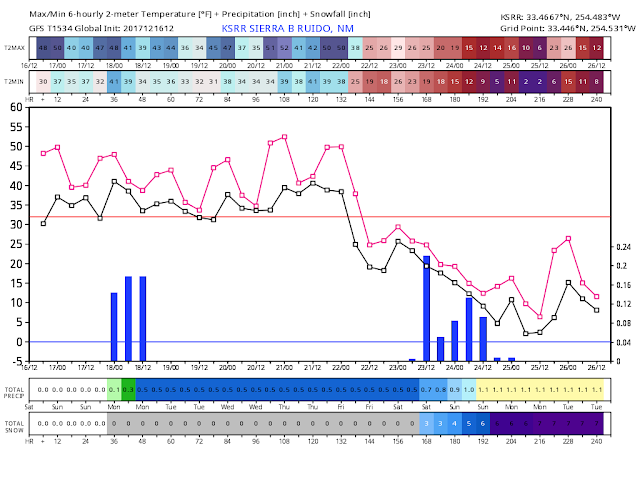 GFS 10-Day Temp & Snowfall Forecast. 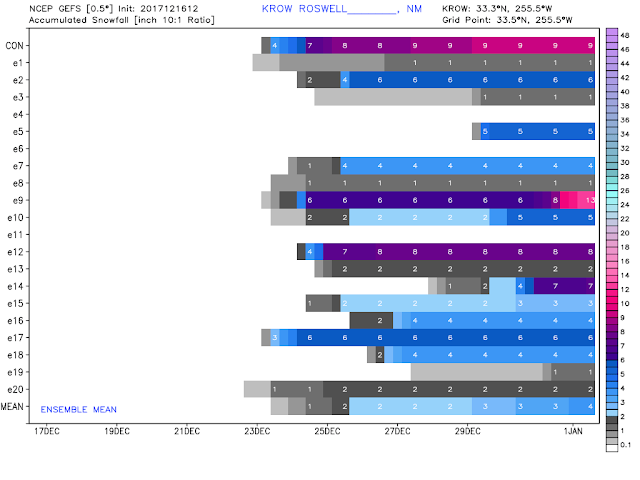 This Mornings GEFS Ensemble Storm Total Snowfall Forecasts. 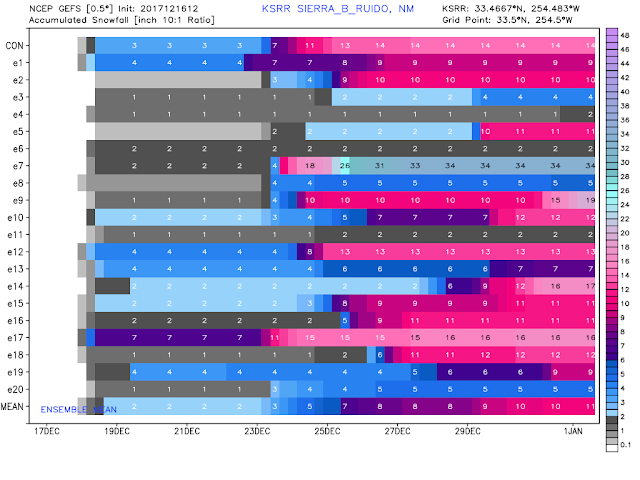 Sierra Blanca Regional Airport - Ruidoso. This mornings GEFS Ensemble Control (CON - Top Line on the graphs) runs forecast close to a foot of snow for most of Southeastern New Mexico. Hobbs ends up with 16"! 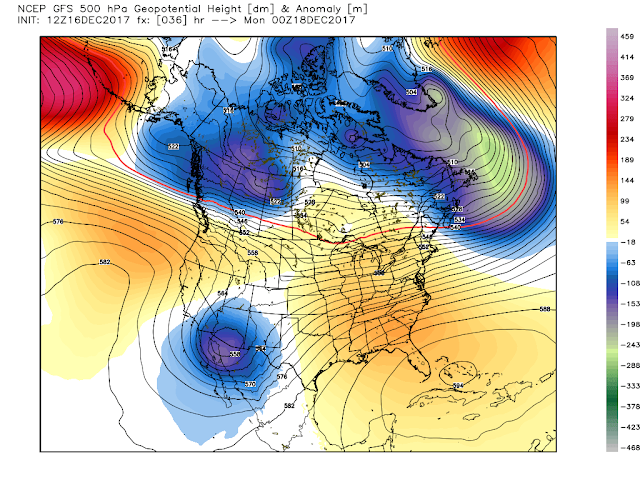 And this mornings runs of the European and Canadian models show little to no snow for the local area by Christmas! Gotta love model forecasting. 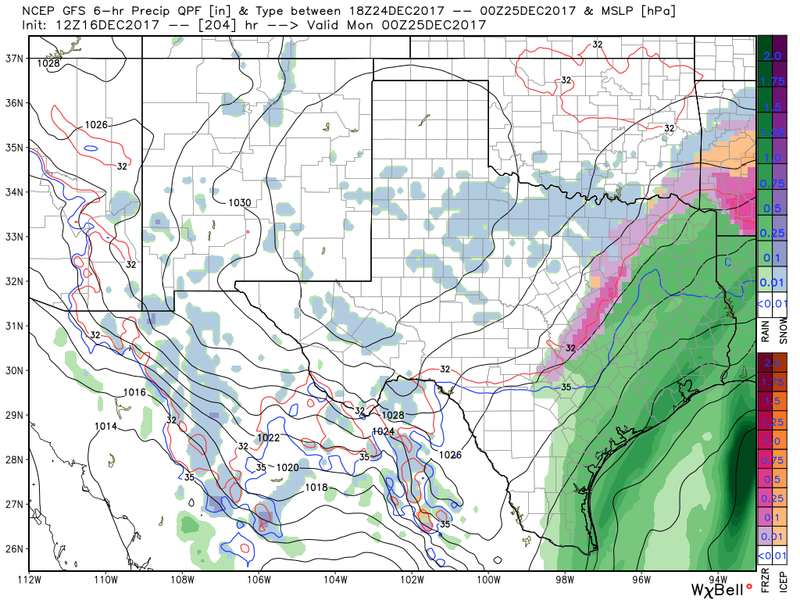 I will update this situation next week as we get closer to the storm and when the models start settling down and come into better agreement.